We were in New York for 5 days and visited a number of restaurants and diners while we were there, below are some of our favourites. Ellen’s Stardust Diner was our absolute favourite place to eat in New York and it’s fantastic for both kids and adults. Located on Broadway, all the waiting staff are aspiring Broadway stars looking to get their break into stardom! 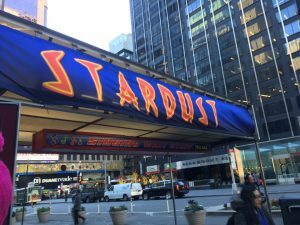 Ellen’s Stardust has had over 200 waiting staff go on to be a Broadway star and it’s a great way to see the quality of Broadway at a fraction of the cost. We were all entertained from the moment we sat down and felt hugely proud when our very own server was up on the table singing when it was her turn. The food was really great too with a decent kids menu plus breakfasts, salads, sandwiches, burgers and more for the adults. You cannot book Ellen’s Stardust Diner unless you are a group of 20 or more so be prepared to queue. We went on a Wednesday at 3pm and queued for about 10 – 15 minutes but when we left at close to 5pm the queue was three times the length. My recommendation is to go at a slightly obscure time if you can. It was the morning of my birthday when we visited Time Square Diner for breakfast and we weren’t disappointed. I had the New York classic of corned beef hash with two fried eggs (sunny side up) and it was delicious. Everyone else were equally as happy with their choices of which there were many, we were constantly topped up with coffee and the service was quick and friendly. If you are looking for a good NYC breakfast, the Time Square Diner is definitely somewhere you should visit. 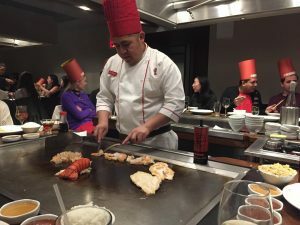 We booked Benihana’s restaurant in New York for my birthday and it was such a great, entertaining experience. The children were in awe as the chef made volcanoes and trains from cooking onions. All the tables are communal and you are sat in groups, where your very own personal chef performs the ancient art of Teppanyaki. We were amazed by the skill of our chef as we watched him slice and dice, and prepare our meal in front of our eyes. When we arrived at Scotty’s Diner for breakfast one morning there was an enormous queue so we knew it had to be good. Fortunately because we were a party of 6 and there was a table for 6 available we were seated straight away. The menu was great and the breakfast and diner had a New York authenticity about it. If you’re after affordable food, friendly service and unlimited amounts of coffee then give Scotty’s Diner a visit. We visited Bubba Gumps in Florida a few years ago and had such a great experience that we had to go to the one in Time Square. Again we weren’t disappointed, the menu for children and adults was fantastic and the food was great. 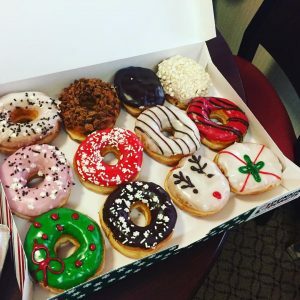 One morning we decided to have breakfast at the apartment, my husband went out to get breakfast and one of the things he came back with was 12 donuts from Dunkin Donuts. My 2 girls thought all their Christmases had come at once. This was the second place my husband visited for our take out breakfast day and came back with smoked salmon and cream cheese bagels and cheese and ham croissants, both of which were delicious! We visited The Olive Garden on our last night in NYC. As a family Italian chain we had been to before, we knew it was a safe bet and it didn’t disappoint. To start you are given some soft Italian bread sticks and a salad, both of which were superb! We all had a pasta dish of some sort for our mains which we all thoroughly enjoyed! 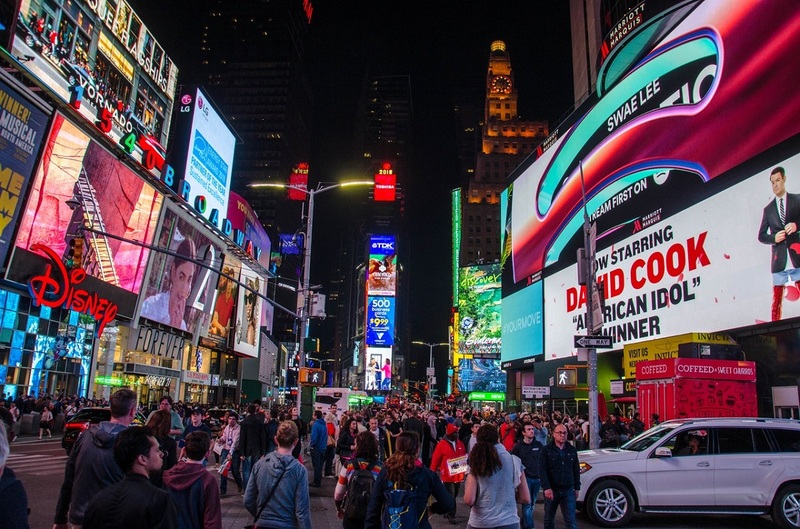 As with most restaurants in Time Square you can’t book so if you arrive at a peak meal time be prepared to wait. We visited this diner on our last day in New York for breakfast and it was another fantastic find. A great authentic American breakfast at an affordable price with unlimited coffee.